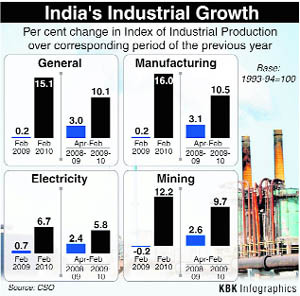 Industrial growth declined for the second month in succession to 15.1 per cent in February compared to the previous month's, on moderation in cement and steel output and may ease further in coming months due to the twin impact of stimulus withdrawal and monetary tightening. Punjab today raised Rs 800 crore and Haryana managed to mop up Rs 1,000 crore, through the sale of its 10-year state development loans. The rising revenue deficit of both states is the reason why they have started raising loans by selling its government securities. GAIL India will invest about Rs 15,000 crore in next 2 to 3 years for laying pipelines to connect consumption centres in North India to fuel sources. An Indian, Ajay Banga, was today named as the Chief Executive Officer of Mastercard. The credit card company named Banga to succeed the current CEO Robert W Selander, who will stay on as executive vice-chairman and board member until he retires on July 31, the company said. Gold prices today skyrocketed by Rs 175 to trade at Rs 17,100, an over one-month high, in the bullion market here today on brisk buying triggered by strong global cues. Glenmark Pharmaceuticals today said its US-based group company has settled a patent dispute with GlaxoSmithKline (GSK) over the launch of a generic version of anti-malaria drug Malarone. Indians are reluctant to invest in mutual funds on fears of high risk and lack of information on how this investment product works, a report says. The euro zone nations have agreed on a euro 30 billion rescue package for their heavily-indebted partner Greece. The finance ministers of the 16 European Union nations, who have euro as their common currency, finalised the details of their bail out plan for Greece at a conference, chairman of the euro group and Luxembourg Prime Minister Jean-Claude Junker said in Brussels yesterday. Microsoft today launched its Visual Studio 2010 and .Net Framework 4 globally, including in India, and said Silverlight 4 technology will be released later in the week. Visual Studio is a widely-used developer tool. The Russian government may acquire a 20 per cent stake in telecom company, Sistema Shyam TeleServices (SSTL), a joint venture between Russian conglomerate Sistema and Shyam Group. Industrial growth, as measured by the Index of Industrial Production (IIP), during the month came down from 16.7 per cent in January and 17.6 per cent in December, according to the official data released today. "The (IIP) growth will moderate in the coming months due to base effect and monetary policy tightening by the RBI. Overall, I expect GDP growth to be around 7.2 per cent in 2009-10," Crisil principal economist DK Joshi said. "Capital goods and manufacturing led the growth which shows the economy is on an investment cycle. The growth could be sustained as it is consumption driven," Yes Bank chief economist Shubhada Rao said. The growth at 15.1 per cent during February, however, is much more than 0.2 per cent recorded in the same month in 2008-09, the fiscal that witnessed the impact of the global financial meltdown on the Indian economy. The manufacturing sector, which is leading the economic recovery, recorded a growth of 16 per cent during the month, up from 0.2 per cent in February 2009. The growth can be partly attributed to the low base of 0.2 per cent of a year ago. Stimulus packages that existed in the review month also helped post good manufacturing growth. According to the IIP data, the consumer durables sector, which was particularly hit by global crisis, expanded 29.9 per cent in February, mining activity rose by 12.2 per cent and electricity generation by 6.7 per cent. For the first 11 months of the last fiscal, industrial output rose by 10.1 per cent against 3 per cent a year ago. As many as 14 out of 17 industrial groups showed positive growth in February. "The healthy performance of the industrial sector is likely to reassure policy makers that they can remove stimulus without disrupting the economic growth momentum," Moody's said. As per the use-based classification of the index, the capital goods and consumer durables sectors recorded a high-growth of 44.4 per cent and 29.9 per cent respectively. Official sources informed TNS that while Punjab proposes to raise Rs 6,000 crore this fiscal through auction of its state development loans through the RBI, Haryana, too, plans to raise Rs 6,000 crore via this yield-based auction. The remaining amount will be raised after these auctions are staggered over different periods during this financial year. It may be noted that while Punjab had raised Rs 5,500 crore through sale of its government securities during the last fiscal, Haryana had raised Rs 4,300 crore in 2009-10. Though the states are allowed to raise up to 3.5 per cent of its GDP through these auctions, last year, because of the recession, states were allowed to raise up to four per cent of its GDP. This is the second time this year that the Centre has announced hike in borrowing limit for the state governments. Other than Punjab and Haryana, securities worth Rs 1,500 crore of Andhra Pradesh government and worth Rs 500 crore of Uttarakhand were also auctioned today. For this auction, government stock up to 10 per cent of the notified amount of the sale of each of the stock will be allotted to eligible individuals and institutions, subject to a maximum limit of one per cent of its notified amount for a single bid per stock as per the Scheme for Non-competitive Bidding Facility. Sources said that both competitive and non-competitive bids for the auction were submitted in electronic format on the Negotiated Dealing System (NDS) today. An investor was allowed to submit more than one competitive bid at different prices. However, the aggregate amount of bids submitted by a person did not exceed the notified amount for each state. The RBI determines the maximum yield at which bids are accepted and securities are issued for a minimum nominal amount of Rs 10,000 and multiples of Rs 10,000 thereafter. Addressing a meet organised by PHD Chamber of Commerce and Industry here, GAIL chairman and managing director BC Tripathi said his company was laying new pipelines to connect cities like Uttar Pradesh, Uttrakhand, Punjab and Haryana. Pipelines are planned to connect cities like Meerut, Saharanpur and Moradabad in UP, Dehradun in Uttrakhand, Bhatinda and Nangal in Punjab and Panipat, Hissar and Gurgaon in Haryana by 2013. Besides, GAIL is expanding its 10,700 km of cross-country pipeline network. It is laying 5,000 km of pipeline to connect gas sources on the western coast to consumption centres in the north by 2013. Of this, about 1,000-km pipeline length would be commissioned by year end and 1,500 km would be added every year over the next two years. GAIL is also laying pipelines to connect to Bangalore, Mangalore and Kochi in next 3 to 4 years. 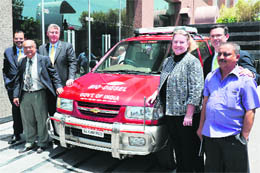 Tripathi said the share of natural gas in the energy basket will rise to 12 per cent by 2012-13 from current 10 per cent. Current supplies of about million standard cubic meters per day is short of demand of 230 mmscmd. Domestic gas production, he said, will rise to 170-175 mmscmd in the next 4 to 5 years from 135 mmscmd currently after new fields of companies like Oil and Natural Gas Corp (ONGC) and Gujarat State Petroleum Corp (GSPC) come online. Standard gold and ornaments spurted by Rs 175 each to Rs 17,100 and Rs 16,950 per 10 grams, respectively, a level last seen on March 8. Sovereign gained Rs 25 to trade at Rs 14,025 per eight-gram piece. The trading sentiment turned bullish as gold rose to its four-month high in the Asian region, touching a 27-year high in Tokyo. In Singapore, the metal gained 0.7 per cent to $1,170, the highest level since December 4, 2009. Some investors shifting their money from weakening equity markets to bullion also caused the prices to improve, they added. Glenmark Generics Inc has settled the litigation pending between the company and GSK over patent actions concerning atovaquone and proguanil hydrochloride 250mg/100mg tablets, the generic version of GSK's Malarone tablets, Glenmark Pharma said in a statement. Under the terms of the settlement agreements, Glenmark will be able to market and distribute its atovaquone/proguanil 250mg/100mg tablets under a royalty-bearing licence from GSK in the third quarter 2011, or earlier under certain circumstances, it said. The settlement agreements are still subject to review by the Federal Trade Commission and the Department of Justice, Glenmark said. Despite being available in the market for over two decades now with assets under management equalling Rs 7,81,711.52 crore (as of February 28, 2010), less than 10 per cent Indian households have invested in mutual funds, according to the report by research and analytics firm Boston Analytics. The report suggests that investors are holding back from putting their money in mutual funds due to perceived high risk and lack of information on how they work. The report is based on a survey of approximately 10,000 respondents in 15 Indian cities as of March 2010. Among respondents with high savings, close to 40 per cent of those who live in metros and Tier I cities said such investments were very risky, whereas 33 per cent of those in tier II cities said they did not know how and where to invest in such assets. The euro group finance ministers are putting into operation a decision by their heads of state and government on March 25 to rescue Greece from bankruptcy as a "last resort" by providing bilateral credits on market conditions and funds from the International Monetary fund (IMF) if it can no longer get credits from the capital markets. "There was no decision to activate the mechanism to support Greece, but now we are ready to put it into operation," Junker told reporters. The announcement by euro zone nations comes amid mounting concern in the financial markets about the cash-strapped Greek government's ability to service its staggering debts of more than 400 billion euros. Last week, the financial markets became jittery over speculations that Greece might default on its debt servicing obligations. Junker said the euro zone nations will provide Greece in the first year 30 billion euros if it asks, supplemented by credits from the IMF. Greece will have to pay an interest rate of around five per cent for bilateral credits compared to 7.5 per cent interest it has been paying for credits from the capital markets. The financial assistance programme is envisaged for a period of three years. So far, Greece has not asked for the EU support. "Together, these technologies simplify the entire development process, enabling developers to build new platforms and build high-quality applications," S Somasegar, senior vice-president, Microsoft Corportion said delivering the keynote address at the TechED 2010, a technology conclave which commenced here today. This was stated by T Narasimhan, deputy chief executive officer SSTL, while talking to mediapersons here today. He was in the city to launch its CDMA services under MTS brand in Haryana, by offering half a paisa per second tariff. He said the Russian government would be investing about $800 million to fund their expansion programme in India. With this, the Russian government may have 20 per cent or little over 20 per cent stake in our venture,” he said. He added that talks between Russia and Sistema were going on to work out the ratio of exact stake of the former in SSTL. He further said the Foreign Investment Promotion Board (FIPB) had already given its approval for this proposal. “We are just awaiting the clearance from Russian government. The process of capital infusion will take another three to four months to complete,” he added. At present, Sistema holds 73.71 per cent equity stake in SSTL, while Shyam Group has 23.79 per cent and the remaining 2.5 per cent is publicly held. SSTL, which has already invested $1.5 billion to roll out CDMA services, is aiming to have a subscriber base of 15 million post expansion. “After rolling out services in the remaining circles, we wish to have 15 million subscribers within 12-15 months,” he said.